That Eskimo game was incredible last night. Mike Reilly to Zylstra for 76 yards and then the kick to end it. Very Aaron Rodgers like last night from Reilly and Duke Williams with an impressive first CFL game. The defense played great, looking forward to the rest of the season. Got to watch the Stamps and Redblacks as well as the Eskimos and Lions...both great games. Eager to see the Calgary and Ottawa rematch this Thursday. Looked like the only real way the Argos did damage, offensively, was the long bombs. Everything was working, but, that's what won the Argos the game. I don't know if they can keep that up. Granted, I'm always worried about Ricky Ray's health but him throwing long bombs all night can't be good, right? Art Briles hired as offensive coordinator by Hamilton. June Jones new head coach. 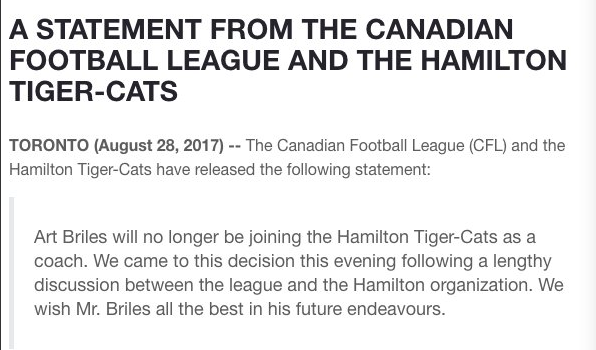 From the looks of it, the Ti Cats are getting absolutely BBQd for this move. A bunch of fans are threatening to leave their seats empty for the remainder of the season and not renew their season tickets due to this move. The Ti Cats have a TON of damage control to handle here, and I bet Briles gone in less than a week. I'm just curious WHO thought it was a good idea before the unbelievable backlash they just received. The problem is, even though they eventually did the right thing, it's asinine that it even reached the point they announced. Is Hamilton having that bad of a season that they need to hire the mummified corpse of June Jones to lead them? You know, it might not be a bad idea. Have they even won a game? They're having a pretty bad year, should have realized that people across the border pay attention to college football too. I'm curious to see how Hamilton will handle the Johnny Manziel situation they've gotten themselves into. Sorry to bring this thread back up after almost a couple months, but we're nearing playoff time.... and my BC Lions, for the first time since 1996, will be out of it. It was a great run for them, which produced four Grey Cup appearances, winning in three of them. I wish them the best of luck for the rest of the year, even if they're only playing for pride, and hope that they can improve to make another run next year. Definitely a strange turn of events that I wouldn't have predicted for this season...B.C. struggling and Edmonton started out on fire before taking a nose dive. Wouldn't have expected the Bombers or Riders to play as well as they have either. The woes of the Eastern Division though are not really a surprise. Congrats to the Argos but how on earth did Calgary bottle that? What can I say? This was one of the most epic Grey Cup games I have seen, and almost rivaling last year's in terms of epicness. Congrats to the Argos! Congratulations to one of the worst NFL coaches of the modern era! 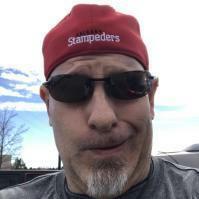 I honestly didn't expect the Argos could win this game, they were 0-4 against the Stamps this year. I think that Bo Levi got a little too greedy on the final drive there, I think they had enough time to come back but they tried to force it...and...well you know the rest. Of course, the real question is can the Argo convert this success on the field into the stands? Also, will Ricky Ray retire? I have a feeling he'll be on the sidelines with the Argos next year learning to coach under Trestman. Calgary throwing deep into double coverage when they were in field goal range, to me, is right up there with "Seattle threw instead of handing Lynch the ball." When i saw the pass leave the QB's hands I said out loud to my wife, "this won't end well." Hats off to the CFL, though, the past 2 Grey Cups have been awesome in terms of drama.